What are the best health foods? There are many foods which can be considered as health foods. These foods help us to keep a healthy body and prevents from several diseases. If you add these healthy foods into your diet then would do a great favour to your body. Health foods are those which are highly rich in various nutrients. Nutrients that are good for all the parts of the body and especially vital for heart health and other chronic diseases. Quality nutrients are also necessary for the physiological health because they can keep the mind stress free & protect from mental diseases. But the list of the health foods can be very long as it's not about only handful of foods. There are many natural foods that come under health foods and we should consume them in a right way. In this article though, we'll talk about 10 foods- which are generally considered very healthy & very popular as well. So, find out 10 best health foods below. Fruits and vegetables are two important parts of a healthy diet. They are high in conventional nutrients, low in calories and contain many unconventional nutrients as well. But in addition to that there many other foods which are extremely healthy and an important part of health diet. These foods are whole grains, nuts & seeds, herbs and animal foods. All of this comes under best health foods list and you must add them into your health diet to get benefited. Apples: Apples are extremely popular, easily available and highly rich with nutrients. They are a great antioxidant fruit, wonderful source of Vitamin C & fiber. The great thing about is that they contain some outstanding unconventional nutrients such as quercetin, kaempferol and myricetin. 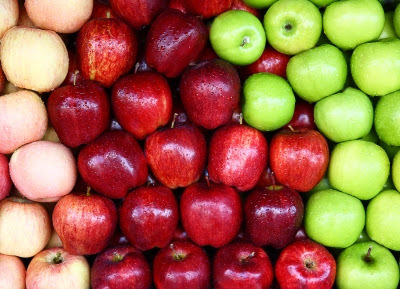 Apples also provide catechins (especially epicatechin), anthocyanins , chlorogenic acid and phloridizin. These are great health-supportive polyphenol nutrients which are responsible for antioxidant and anti-inflammatory health benefits. Special Benefits- Apples are especially great for cardiovascular health. They are very effective in lowering triglycerides and LDL cholesterol levels. Broccoli: It is one of the best foods for health. Broccoli is a strong source of many vitamins such as Vitamin A, C, K and B vitamins. Broccoli provides several nutrients including manganese, fiber, tryptophan, potassium, calcium and selenium. Broccoli is also concentrated in phytonutrients as well. It contains glucosinolates which is a type of phytonutrient and known for cancer preventive benefits. Health benefits of broccoli are including antioxidant benefits and anti-inflammatory benefits. Special Benefits: The strong antioxidant, anti-inflammatory and pro-detoxification components in broccoli make it a great food for cancer prevention. Broccoli can also solve Vitamin D deficiency problem. Chicken: Chicken is a great source of animal protein. It also contains very good amounts of B vitamins (B3 & B6), tryptophan, selenium, phosphorous and choline. Chicken is known for providing health benefits such as anti-cancer, anti-Alzheimer's and protection from loss of bone. It’s a very good energy enhancing food as well. Special Benefits: Vitamin B6 content helps protect arteries from homocysteine damage and reduce the risk of heart disease. Use Skinless chicken to make it a low fat food. Brown Rice: It contains very good amounts of fiber, manganese, selenium, magnesium and tryptophan. Brown rice also contains certain amounts of B vitamins. This healthy food is known for lowering cholesterol levels, reducing metabolic syndrome and keeping the nervous system healthy. It is an anti-cancer food as well. Special Benefits: It’s a high fiber and energetic food and a great weight loss food. Basil: The highly fragrant, bright green leaves of basil herb contain many therapeutic properties. Basil is famous for antioxidant, anti-inflammatory and anti-bacterial properties. It is an excellent source of Vitamin A, C & K, dietary fiber, manganese, magnesium, and potassium. Basil is a very good herb for the heart as it reduces the risk of development of atherosclerosis. Special Benefits: The unique arrays of active constituents called flavonoids found in basil provide protection at the cellular level. Basil also reduces unwanted bacterial growth. Peanuts: Highly rich in folate, niacin, copper, protein and manganese. Peanuts provide high amount of monounsaturated fats, and a flavonoids called Resveratrol. These nuts are a good source of folic acid, phytosterols and phytic acid as well. Peanuts provide health benefits including anti-cancer, weight loss, gallstones prevention and anti-Alzheimer's benefits. Spreads and oils provide essential fats but these are only needed in very small amounts. Choose low fat and reduced fat spreads andoils such as rapeseed or olive oil (monunsaturated) instead of hard margarine, lard or butter. All oils contain some amount of calories, so measure out the oil, don’t just pour it onto the pan. Special Benefits: Peanuts are a wonder food for the heart. It lowers the risk of cardiovascular and coronary heart disease significantly. Avocados: The avocados are rich source of monounsaturated fats for heart health and also they are rich in fiber, Vitamin K, Vitamin C, Vitamin B6, folate and potassium. Avocados are strong source of some carotenoid antioxidants including alpha-carotene, beta-carotene, beta-cryptoxanthin, lutein and zeaxanthin. Avocados regulate blood sugar levels and provide anti-inflammatory benefits. Special Benefits: It’s a great food for the heart. Avocados can promote heart health quite effectively. Carrots: Carrots offer many health benefits such as heart health benefits, anti-cancer benefits and eye health benefits. This vegetable is known for its antioxidant properties and a powerhouse of many nutrients including fiber, molybdenum, folate, potassium and various vitamins. Carrots contain several phytonutrients as well. Special Benefits: Carrots protect against high blood cholesterol and heart disease. Tuna: Tuna can make an outstanding contribution to your health diet. It is an important source of omega-3 fats, B vitamins, potassium and selenium. Tuna fish contains nutrients which are extremely healthy for the heart. It provides both antioxidant and anti-inflammatory benefits. Special Benefits: Both EPA and DHA are critical omega-3 fatty acids are found in tuna responsible for regulation of the body's inflammatory system and prevention of excessive inflammation. Chickpeas: Chickpeas or Garbanzo beans are an excellent low cost source of protein, a very good source of folate, iron, fiber, tryptophan and manganese. Chickpeas are considered as one of the best health foods because they are responsible for many health benefits including heart health benefits, blood sugar benefits, weight loss benefits and digestion benefits. Chickpeas are highly rich in many antioxidant phytonutrients and a wonderful food for the health conscious people. Special Benefits: Chickpeas are especially very helpful for controlling blood sugar levels. Fiber and protein provide crucial boost for blood sugar regulation. These are excellent heart food as well. Above mentioned foods are 10 best health foods but there are many foods that can join this list very easily. We'll talk about those foods later in some other article. Remember, healthy foods are those that contain high amounts of vitamins, minerals, phytonutrients and have major positive impact on our health. Last but not the least, most health foods contain anti-oxidant and anti-inflammatory properties which are great for keeping us healthy. There is lot of way to loss your weight but Meal Plan is the best way to loss weight fast. If you wanna more about it please visit here.